The Freedom-Carry is the most versatile holster in the Crossbreed® lineup. The slim design of this holster gives you the freedom of a comfortable carry, while being supported by the locking clip design. The Freedom-Carry holster will accommodate full size firearms allowing you to carry in many positions from the Appendix, Cross draw, and strong side. The leather shape of the Freedom-Carry has just the right amount of leather to be very comfortable while keeping the frame and slide of the pistol from contacting your body. 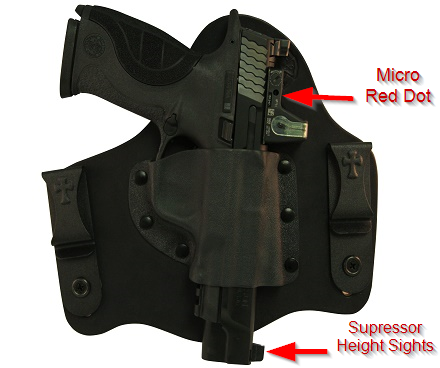 The pocket of the Freedom-Carry is mounted in a straight draw position and boasts an adjustable cant clip allowing the holster to be moved to the various carry positions. The Freedom-Carry also accepts firearms equipped with various weapon lights, lasers, and slide mounted Micro Red Dot sights. 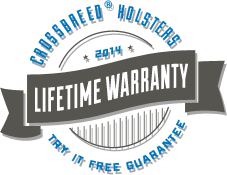 As with all of our holsters, the IWB Freedom-Carry comes with our “Two Week, Try it Free Guarantee” and a Lifetime Warranty. Order your CrossBreed® Holster and begin Carrying the Cross with the most concealable and comfortable holster on the market today. Product Size: 6.25" x 1.5" x 8"